If you fancy hearing some great songs performed in an entirely alternative and unexpected way, I can recommend giving 'Popscotch' a go. In Fireworks* we cover a vast array of different genres and styles, but despite likely having one of published media's most varied spectrums of coverage, there are still many albums that are simply too diverse to justify inclusion. That is not to say they are any less worthy of consideration, it's just they are too far outside the boundaries. However here on Rocktopia, we have expanded the range of what we cover and we have space to investigate and include not only everything from Fireworks but other broader offerings. As Reviews Editor, I obviously get to listen to everything that comes in and occasionally there is the odd album that just grabs my interest, but due to its style, heaviness or such like reasoning, I can't include it in the magazine. There were two that really caught my ear and whilst both feature a similar genre in their make-up, they couldn't be more polar opposites. The first was a Death Folk Metal band called Equilibrium which I really liked and this was kindly covered recently by my colleague Franco Cerchiari and you will find it elsewhere on the site. The other was Acoustic-Folk act Driving Mrs Satan. DMS is made up of Claudia Sorvillo (vocals), Giacomo Pedicini (double bass) and Ernesto Nobili (guitars, ukulele) with nine other musicians contributing various drums, piano, violins, cellos and backing vocals. The band are Naples and London based and formed in early 2012 when Pedicini and Nobili asked Sorvillo to lay down some vocals; the band was born. So what the hell has Acoustic-Folk got to do with Rock music and Rocktopia I hear you ask? 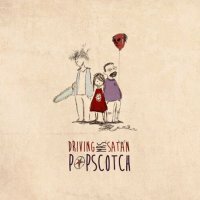 Well, their debut 'Popscotch' is a collection of Heavy Metal covers done in their unique Acoustic-Folk style. Now, I know that will have some of those with a more traditional and less eclectic palettes running to the hills, but for those readers with wider tastes, stick around; this is a rather delightful record. 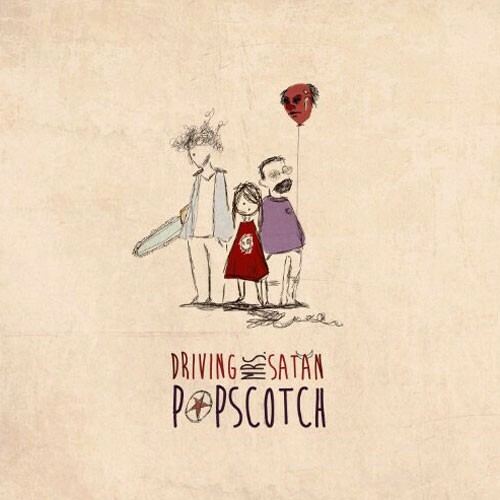 'Popscotch' features eleven songs from various Metal legends all delivered in a soft Folksy and acoustic way which obviously results in them having an very different feel. Whilst some reinterpretations work better than others for me personally, they all have their own qualities. The album opens in fine style with 'I Want Out' (Helloween) with its picked acoustic base and tinkering piano and strings accompaniment. 'Killers' (Iron Maiden) is a step slower in pace and a lazy, almost dreamy affair whereas 'Killed By Death' (Motörhead) skips along fuelled by a breezy rhythm with a slightly Mexican air added through the trumpets. There is also the upbeat and sunny 'Never Say Die' and the relaxing album closer 'From Out Of Nowhere' (Faith No More). The only track that didn't really work for me was 'Battery' (Metallica) which I found to be a bit too folksy and dreamy for me. My three favourite covers appear together in the middle of the album. 'Hells Bells' (AC/DC) is an acoustic guitar driven piece with piano and some finely delivered vocals that combines to create an highly enjoyable version of the song. The other two highlights are both Iron Maiden covers; '2 Minutes To Midnight' has been slowed down to a very basic Folk song whilst 'Can I Play With Madness' is a cheerful rendition that bounces along with bright musical constrictions from the guitar and cello. I am completely aware this album will not appeal to everyone. It is a Folk and not Rock or Metal and that in itself will be negative for many people. But if you have a wide taste and can appreciate many genres, this cross-over may well hold appeal. Pedicini and Nobili can play their instruments well and should be commended for their varied vision, but the star of the show is Sorvillo who has a simply gorgeous voice. Overall the different approach to the songs works well and it's great to hear such well know numbers given such a different make over. If you fancy hearing some great songs performed in an entirely alternative and unexpected way, I can recommend giving 'Popscotch' a go.